In today’s fast paced business world, with all our modern technology right at our finger tips like emails, e-cards, and voicemail, mailing actual business get well cards to co-workers or business associates would have more personal meaning than you can imagine. 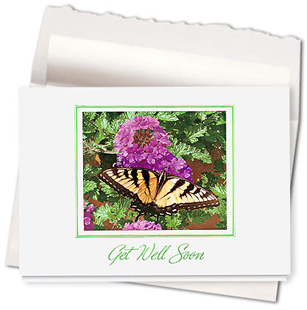 Design #564AR, Butterfly Wishes Get Well Card, printed on glossy white card stock features a picturesque view of flowering foliage and nature’s quiet beauty the – butterfly. Green sun kissed leaves displayed behind small clusters of delicate violet colored flowers guide your eyes right into a summer garden paradise. Perched on one of the flowers is a large swallowtail butterfly, with its wings fully spread out, capturing the brilliant yellow and black color design on its wings. This summer garden picture is then framed in a green foil border that matches the sun kissed foliage of the flowers and leaves that appear in the background. Centered underneath the framed picture in the same green foil are the words “Get Well Soon” printed in a light airy script that matches the card’s design theme – summer, fresh, and airy. This business get well card, with its picture of a butterfly and summer flowers, contains symbols that bring warmth, comfort, and healing wishes to those who are not feeling well or are on their way to recovery. Sending this business get well cards design is a simple yet refreshing way to express your special wishes to someone. This is a very calming card – wonderful color and butterflies have so many meanings for so many people. They usually remind you of someone or somewhere that you remember. When I see a beautiful butterfly I always think it is a friend or family member that has passed that just wanted to see me. I just love butterflies. I’m crazy about anything to do with nature. Sending get well wishes in this form truly communicates positive thoughts and sentiments. I used to love butterflies as a kid. This design brings a nostalgic feel . Love it .